My left bicep and tricep and forearm too, are all visibly quivering. I have nearly my entire bodyweight resting on my left hand and am trying to focus on keeping my body in perfect parallel with the wall beside me. Is it over yet? How many breaths has it been? Am I going to fall? So many thoughts are racing through my mind, all milling around the central idea that I’m doubting my ability to hold this sideplank and would like to move on to another pose. And then I remember: Breathe and wait. I don’t know if it’s my “mantra” but it’s a concept to which my yoga practice has enlightened me and it has profoundly influenced my life both on and off the mat. I say “enlightened” because I remember the exact moment during a challenging class when it occurred to me that as much as I tried to avoid the exertion of some poses, I was really just 5 breaths away from both relief and the positive results I sought. The rest of that class was effortless; I could do anything if I only had to do it for 5 breaths! Historically, as a self-diagnosed overanalyzer, I’ve worked myself up into such emotional, seemingly dire personal dilemmas that I was sure there was no coming back to reality. Sleeping problems, chronic pain, headaches – I’d self-inflicted them all. And not only did I overanalyze everything but I required an immediate resolution to every problem I’d pinpointed. 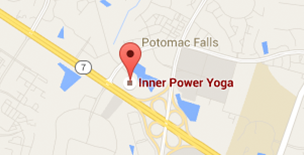 I needed a way to talk myself down from these panicked states and beginning my practice at Inner Power Yoga offered me that. Once I had the method, it wasn’t long before breathe and wait revealed itself. For me, this mantra isn’t about letting life pass you by, it’s about giving yourself a set time period before making that hard decision, taking action or simply releasing the pose. It’s amazing how many situations have either taken care of themselves while I’m breathing or have become easy fixes once I’m centered and calm. At times a bit of self doubt returns when I think, I’ll have to do sideplank again tomorrow. And the day after that… But I can’t worry about tomorrow. All I can focus on is these 5 breaths. Labor Day signals the end of summer filled with great experiences, wonderful beach vacations and warm sunshine to make us smile, but we can look forward to a brand new beginning with all its promises as we enter fall, which for many of us is our favorite season of the year. What are your goals and plans for September? Do they include doing something that has scared you in the past and it takes courage to finally say, “let’s do it!”? I have read it somewhere that courage isn’t an absence of fear, it’s doing what you are afraid to do. It’s having the power to let go of the familiar and forge ahead into new territory. For a wonderful group, that means starting on an amazing and fulfilling path as they embark on their Teacher Training course with us starting in a few weeks. I could not be any more excited about sharing what I know and seeing them shine during the next six months! So take a leap, and do something you have been afraid to do; be it skydiving or having a difficult conversation with someone to give you closure. Face the music and you face your fears! As John Henry Newman said, “Fear not that your life will come to an end but that it will never have a beginning.” You will be glad you did! We have our Special Holiday All Levels Practice with Ursula from 9:30-11:30 am on Monday September 5. All other classes that day are canceled! Please mark your calendar for a great program coming up in November! Back-to-school Special: 20 Class Pass Sale During the Month of September! Now that the kids are back to school, and we are all back from vacation, jump start your yoga practice with a 20 Class Pass (good for 3 months) AND a 60 minute Private Session! This pass is perfect for you if you are coming back to your mat after some time away and would like more personalized attention to help your “trouble spots” or simply would like some one-on-one time to get your yoga questions answered. Please let Ursula know that you would like to take advantage of this offer! And finally, we would like to congratulate our wonderful Jessica Howard who is now the new Ambassador for lululemon Athletica! We can’t imagine a better person to represent our favorite brand, and we are so proud of you, Jess!